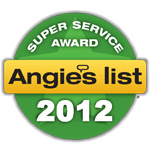 Angie's List has awarded FAS Windows & Doors the Super Service Award in Orlando, Florida for 2010! Each year this award goes to companies that maintained a superior service rating. About 5% of companies that are on Angie's List meet their eligibilty requirements. Companies need to maintain at least a grade point average of all member reports of 3.5, which is equivalent to an A and be in good standing with Angie's List. In the past three years, FAS Windows & Doors has maintained 3.5 due to your reports, and we appreciate your feedback in Angie's List. If you haven't already, become a member and share your experience with FAS! We are honored to receive this award for the Orlando area! Thank you from everyone at FAS Windows & Doors!